﻿Today's prompt: Health Activist Choice 2. Like our other first Health Activist Choice day, today’s topic is up to you! Write about something you’ve had on your mind. Today, I have endo on the brain. I went to my endocrinologist this morning, as I do every 3-4 months or so. I've only ever had two endos in my whole life. The first was my pediatric endo, whom I saw till I was 18, and I've been with my current endo ever since. I like my endo, I really do. But boy howdy, was I a hot mess this morning. What is it about going to the endo that causes me to completely freak out? The butterflies in my stomach, the anxiety, the stress. Yikes! I love my endo. He's a very kind, laid back kinda guy. He has never, ever made me feel badly about myself. Even back in November, when my A1c hit 8.0. I was horrified and holding back tears, and he just said, "Well, that's higher than I'd like. Let's see what we can do to get it down." I also found the DOC back in November. 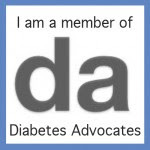 So, thanks mostly to my DOC friends, as well as the CGM, my A1c dropped from 8.0 in November to 7.6 in February. Woot! So, back to today. I was really hoping my A1c had gone down. I have been trying to take better care of myself. But between being sick and my food issues rearing their ugly heads over the last few weeks, my averages weren't necessarily stellar. But I was still hopeful. So when the number came back at 7.6 again, I was really disappointed. Yes, I'm still struggling with apathy, burnout, and my relationship with food, but damnit, I've been trying. Grrrr! While I was disappointed, my endo, on the other hand, was very pleased. He said that it's ok that it didn't go down. The fact that it stayed the same even with me being sick shows that I am trying and the CGM is helping. And here I must apologize for not giving you guys credit where it's due. I've mentioned the DOC to him before, but didn't expound on how much you all have helped me. I should have done that today, but was too worked up. Anyways, so endo made a few minor tweaks here and there, but was really pleased overall. So I'm trying to focus on that. The fact that it stayed the same is good. I am making progress by doing the next thing. I left the office still a little disappointed, but happy my endo was happy. Oh, and all the stress and anxiety leading up to the appointment led to a lovely 248 and an afternoon of stubborn 200s. Oh well. But that A1c's gonna be lower when I go back in August, damnit! I CAN do this! Don't be so hard on yourself - you are doing a great job!!! And I'm so glad your endo recognizes that! I know what you mean about endo stress though - I have an awesome endo too but I still get so stressed and nervous before each appointment.